Print these pdf files for fun away from your computer. For best results, print in color on heavy white paper. For additional cake decorations, print extra copies of decorations pages. 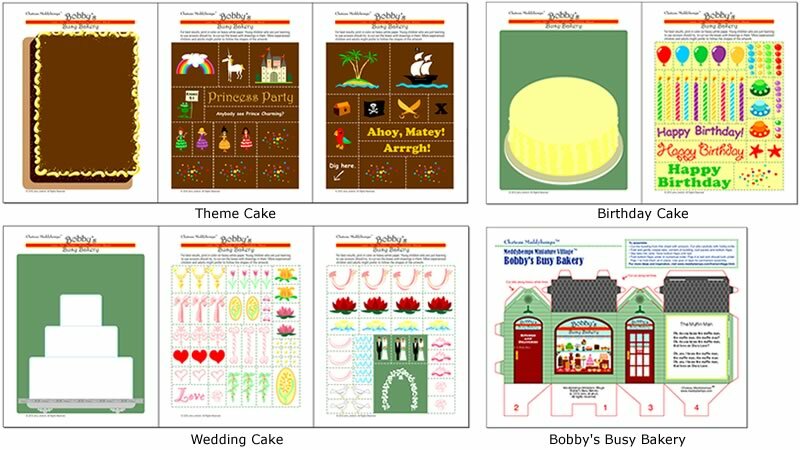 Print a Theme Cake and its decorations (3 pages). Print a Birthday Cake and its decorations (2 pages). Print a Wedding Cake and its decorations (3 pages). Print Bobby's Busy Bakery. Cut and fold to Build. It can be used with other Meddybemps Minature Village Buildings.